Wolfgang Streeck argued last week on LSE Brexit that the EU was a ‘liberal empire’ that is about to fall. Peter Ramsay (LSE) suggests that the EU is a very particular type of empire, one that has arisen from the political decline of the nations that comprise it, and that this explains the tortured politics of Brexit. Wolfgang Streeck does the Brexit debate a service by reminding us of the imperial character of the EU. British Remainers have claimed that Brexit is all about nostalgia for Britain’s maritime colonial empire. They have conveniently forgotten that the European continent is familiar with a different tradition of land-based multinational empire. Remainers would very much like the UK to Remain a part of this type of empire. Streeck calls the EU a ‘liberal empire’ because it is explicitly committed to constitutionalism, private property, and competition. It is imperial nevertheless because one of its member states – Germany – has become hugely dominant over the others, and because EU institutions have progressively constrained the democratic process at the national level in the interests of the markets’ big players. Streeck’s account of the EU as an empire tells us much about its operations. Nevertheless, we should be wary of creating a left-wing version of conservative Euroscepticism, in which we replace bossy Brussels bureaucrats with greedy German capitalists as our image of EU overlords. It is not that there is no truth in either story, but they both tend to obscure the most significant aspect of the EU. 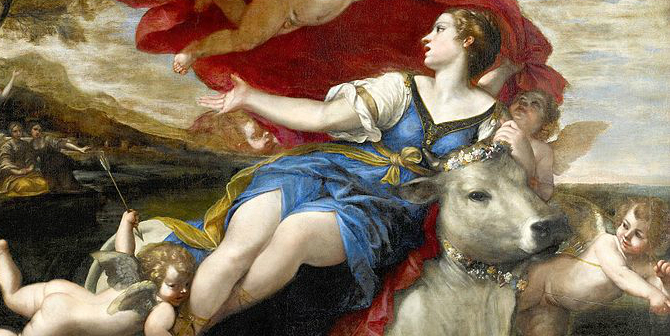 Francesco Albani, “Jupiter, in the shape of a bull, carrying off Europa”, Public Domain. If the EU is an empire then it is exceptional in being a legally voluntary empire. However much German or EU officials may connive to punish Britain economically and diplomatically for proposing to leave, Britain’s right to leave is not contested in Berlin or Brussels. Rather it is in London that Britain’s right to leave is bitterly contested by a British ruling class that is fighting to Remain. If Germany has acquired the position of an imperial hegemon, it has not been by conquest or through an overweening sense of national destiny or racial superiority but rather by default, a result of the weakening of national loyalties within all of the EU’s member states. The EU’s liberal empire is a type of government improvised by national governing elites that are reluctant or no longer able to rely on the political authority provided by democratic politics. Instead of the nation within, those governing elites look outwards to supranational intergovernmental arrangements for their authority. It is this peculiar characteristic of the EU’s ‘liberal empire’ that explains the tortured political process in Britain following the Brexit referendum. The electorate voted to ‘take back control’ of politics and the state. In response, the bulk of the political class has been united with the civil service, big business and academia in a shared determination to resist that. The British elite prefers intergovernmental collaboration to assertions of national sovereignty. Its preference for this way of governing is so ingrained that the government has been unable to imagine adopting a robust negotiating position with the EU, and even the weak negotiating efforts of the executive have been relentlessly, and very publicly, undermined by Parliament and other politically influential figures. The effect has been to create a situation in which the options now available to the UK are so unattractive that a sense of emergency can be manufactured. In this climate, it might be possible, one way or another, to nullify the effect of the original vote to Leave. While, as Streeck argues, the German hegemon and its ally France have an interest in making the British people pay a high price for daring to defy the EU, their most effective ally in that endeavour has been the British elite itself. The British ruling class finds in the EU an effective and attractive way of asserting its interests. And this is so even if Germany is the major gainer from the arrangement. The British elite’s repulsion from the claims of the nation is much stronger than any downsides it may experience from playing economic second fiddle to Germany. The EU is a voluntary empire made up of states that are in denial of their national character: in denial of the fact that the state’s authority derives from the political nation. This turn by Europe’s ruling classes against the nation has transformed the terrain of politics in Germany’s ‘liberal empire’. So Streeck observes of Brexit, that in so far as the decision to leave the EU ‘was driven by nationalist…concerns, it may amount to a historical mistake’. The reason for this, he suggests, is that Britain is likely to lose international influence in Europe and the world while France will gain what the UK loses. His prognosis may be right but, as any observer of the Brexit debate will have noted, it is British Remainers who have repeatedly bemoaned this likely loss of British international influence resulting from Brexit. As Richard Tuck has shown, the case made in the 1960s for the UK joining the European Economic Community was dominated by concerns over how to maintain Britain’s global influence as the British Empire declined. Similarly, contemporary Remainers reject nationalism, the better to ensure Britain’s global influence. The laughable post-Brexit fantasies of the UK’s current Secretary of Defence only underline the fact that Leaving the EU will radically limit Britain’s remaining imperial ambitions. For this reason, Brexit is welcomed by true internationalists the world over. The point to grasp is that the ruling classes of the EU’s former imperial states have stopped trying to project their influence at home or abroad by mobilising nationalism. Instead, they do it through participation in the supranational empire of intergovernmental cooperation and by opposition to the alleged nationalism of others (particularly of Russia and of their own populations). Streeck declares that the liberal empire is ‘about to fall’. He points to the EU’s current evolution towards still more authoritarian and now militaristic politics, driven by tensions that may yet bring it down. So far, only the populist right has really understood the distinctive aspect of the EU’s liberal empire – the denial of the nation by the imperial ruling classes of Europe. Democrats and internationalists urgently need to catch up. Against the claims of imperial cosmopolitanism, we need to reinvigorate the idea of the nation as the site of the authority of the people and of solidarity with the nationhood of others. Against the identity politics of both the populist right and the woke left, we need to popularise the idea of the people as a citizenry of self-determining persons. Peter Ramsay is Professor of Law at the London School of Economics. He will chair Wolfgang Streeck’s lecture ‘Taking Back Control? Brexit and the Future of Europe’ at LSE on Friday 15 March in the Sheikh Zayed Theatre at 6.30pm.